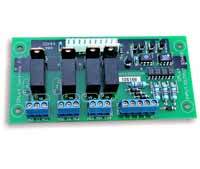 The IOX44 performs the dual functions of a 4-relay output board and a 4-channel input isolator. The relays can be driven off solid state SPLat outputs while the opto-isolated inputs must be connected to regular SPLat NPN style inputs. The board is compatible with all SPLat controllers which have "direct connect" NPN inputs and ground switching (NPN) transistor outputs. The relays are rated up to 5A at up to 240VAC (resistive load). The relay contacts are brought out to screw terminal blocks. 2 relays are brought out as independent SPDT (form C) changeover contacts. The remaining 2 are brought out as SPST (form A) normally open contacts with a shared common. Each relay coil has its own voltage regulator, so the board can operate with supply voltages between 12VDC and 24VDC without risk of overheating the relay coils. The 4 opto-isolated input pins have a single shared common terminal. When a voltage is applied between an input pin and the input common, the input will appear ON to the SPLat controller. The inputs can be activated by AC or DC voltages between 12V and 240V. Note: This is an old design. Unless you specifically need the isolated inputs we recommend one of the expansion boards like the XIRO16. Developer's kit, contains the adapter board with 4 opto-isolated digital inputs and 4 relays, 600mm shielded connecting cable, matching connectors and mounting standoffs. Adapter board with 4 opto-isolated digital inputs and 4 relays, matching connectors and mounting standoffs.